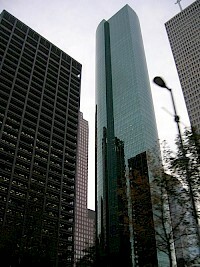 Trammell Crow Center is a 50-story postmodern skyscraper at 2001 Ross Avenue in the Arts District of downtown Dallas, Texas. With a structural height of 708 ft (216 m), and 686 ft (209 m) to the roof, it is the sixth-tallest building in Dallas and the 18th-tallest in the state The tower was designed by the architecture firm, Skidmore, Owings and Merrill, and has a polished and flamed granite façade, with 1,200,000 sq ft (111,000 m) of office space. 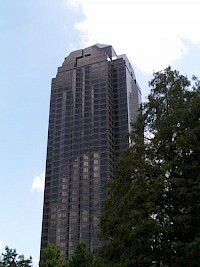 The Wells Fargo Plaza, formerly the Allied Bank Plaza and First Interstate Bank Plaza, is located at 1000 Louisiana Street in downtown Houston, Texas (USA). This building is currently the 13th-tallest Building in the United States, the second tallest building in Texas and Houston, after Houston's JPMorgan Chase Tower, and the tallest all glass building in the western hemisphere. It is the tallest building named for Wells Fargo.